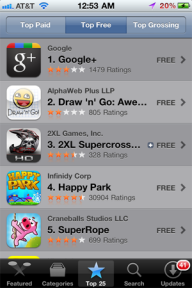 After less than 24 hours of being live, the Google+ iPhone app has hit the number one free spot in the Apple app store, beating out “Draw ‘n’ Go: Awesomeness!” for the top slot. This is quite impressive considering that the app, which started out buggy and continued to be buggy after the “fastest update to an iPhone app” Erick has ever seen, is currently only pertinent to at the most an estimated 18 million people in the field test AND that Google has its own mobile operating system to focus on, Android. What makes this milestone important is the fact that Google+ competitor Facebook currently has the top downloaded free iOS app of all time — So Google+ is in good company. Of course Google does have a lot of marketing leverage for whatever it needs to push, namely its highly trafficked homepage. You could put anything on there (Paul Carr’s book for example) and it would do well. But, at an average of three stars currently in its pretty substandard version, I’m pretty excited to see what the app will rate/rank when it actually works.